Contemporary lines and a nod toward the American Mission style, combine to make this a truly versatile arbor, at home with many architectural styles. 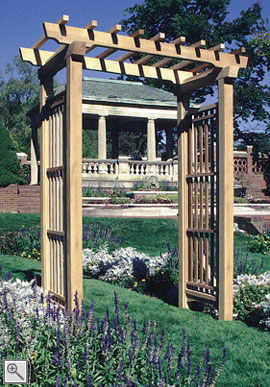 The arbor is complemented nicely by the Chippendale Gate as shown with the English Arbor. The arbor is also available with any of our gate and extension styles, as referenced in our Arbor Gates and Extensions section. Constructed of western red cedar, 4" x 4" posts, triple-layer lattice side panels and stainless steel fastenings. 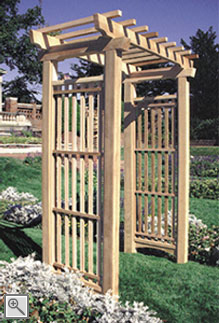 The walk-through opening for this arbor may be customized to sizes of 6' or greater. Call for pricing and shipping details. For opening sizes greater than 6' call for pricing.